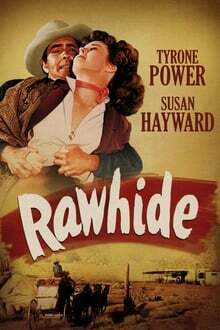 Rawhide is directed by Henry Hathaway and written by Dudley Nichols. It stars Tyrone Power, Susan Hayward, Hugh Marlowe, Jack Elam, George Tobias, Dean Jagger and Edgar Buchanan. Music is by Sol Kaplan and Lionel Newman and cinematography by Milton Krasner. A stagecoach station employee and a stranded woman traveller and her baby niece find themselves held hostage by four escaped convicts intending to rob the next day's gold shipment. A Western remake of 1935 crime film Show Them No Mercy, Rawhide is the embodiment of a solid Western production. Beautifully photogra... read the rest.